MIXED martial arts superstar Ronda Rousey is world-famous for her take-downs in the Octagon but she’s proving just as talented on the outside. Rousey just laid the smack down on boxing champion Floyd Mayweather after pipping him for Fighter of the Year honours at today’s ESPY Awards. It’s not the first time Rousey has burnt Mayweather with a one-liner about his history of domestic violence. Back in May, Rousey was asked whether she could take down Mayweather in a fight. But their beef dates back even further than that. In February, 2014, Rousey stated she could beat Mayweather in a mixed martial arts fight. When he was made aware of Rousey’s comments, Mayweather revealed he hadn’t even heard of her, and referred to her as a he. “I don’t even know who he is,” he said. Which makes Rousey’s win this year even sweeter. “I’d like to see you pretend to not know who I am now,” she taunted. Both Rousey and Mayweather have had spectacular results in the past 12 months. Rousey pushed her record to 11-0 with blistering finishes against Alexis Davis and Cat Zingano. She knocked out Davis in 16 seconds at UFC 175 before submitting Zingano with a straight armbar at UFC 184 in just 14 seconds. Her next fight is at UFC 190 against Bethe Correia on August 1. 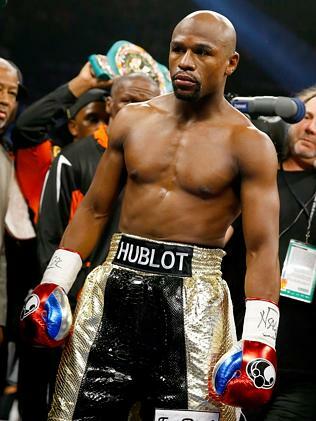 Mayweather (48-0) also stayed unbeaten with a pair of one-sided victories. He comfortably defeated Marcos Maidana in their rematch, before capturing the world’s attention with a unanimous decision win against Manny Pacquiao in a fight that reportedly netted him $180 million. Mayweather is yet to announce an opponent for his next — and potentially final — fight in early September. But Andre Berto is expected to be given the golden ticket. Rousey isn’t the only one to give it to Mayweather in the past 24 hours. A redditor used an AMA with actor Sir Ian McKellen to have a crack at the boxer.